The wonderful trek to the base camp of the world's tallest mountain peak is one of the most beguiling activities for any enthusiastic trekker. As a matter of fact, the Everest Base Camp Trek is so popular that thousands of trekkers from all parts of the world visit Nepal in order to experience the serenity of the mighty Sagarmatha. Not only does trekking make one appreciative of the natural treasures that the world harbors, but it is also one of the best ways to experience cultures that would not be confronted otherwise. Starting with an informative sightseeing tour of the UNESCO World Heritage Sites of the Kathmandu valley, the trekking journey begins with a short scenic flight to Lukla from Kathmandu. Trekkers walk on mesmerizing trails that scintillate through the trans-Himalayan lower terrains of the Khumbu and progress onwards until finally reaching the base camp at the elevation of 5,364 meters. The journey includes visiting many prominent Sherpa villages and settlements of the Khumbu, like Namche Bazaar, Tengboche, Dingboche, and Pheriche. Throughout the journey, the sight of the Everest peaks like Lhotse, the Ama Dablam, Tawache, the Kongde Ri and the Thamserku among many others, including Mount Everest adorn the distant vistas of the Sherpa capital of Nepal - the Khumbu. 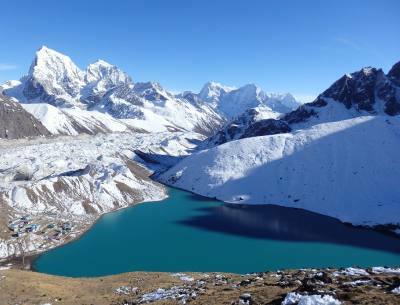 Not only that, but the trekking journey also includes going through the Sagarmatha National Park- a UNESCO Natural World Heritage site, as well as visiting the vantage point of Kalapatthar from where the panorama of the Mount Everest massif and its neighboring peaks are extraordinarily prepossessing. 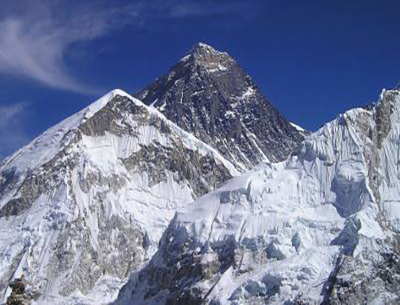 The Everest Base Camp Trek is best done during the seasons of spring (March to May) and autumn (September to December). The spring and the autumn seasons present the best weather and temperature conditions for trekking, were the skies remain clear and the views of the mountain peaks against the river valleys can be seen clearly. The Everest Base Camp Trek by Destination Unlimited is a well-crafted, all-rounded package that presents trekkers with the best features of Khumbu in a comfortable way. Our team of professional and well-trained veteran staff always has the comfort of our valued customers in mind at all times, and with us- you get the absolute best services. You can arrive at the Tribhuvan International Airport at any time. Upon landing, you will be greeted by one of our staff members. He will help you get transferred to your Hotel in the city. He will also convey further information to you about the plans and programs of the trip. There is nothing else planned for today, so you can relax at the Hotel after check-in. Overnight stay at the Hotel in Kathmandu. Today, you will have a sightseeing tour of the Kathmandu city. Kathmandu has four major UNESCO World Heritage sites- the Pashupatinath Temple, the Boudhanath Stupa, the Swayambhunath Temple and the Kathmandu Durbar Square. Each site holds religious and historical importance to the people of the country and each is built in unique Nepali architectural styles. After the tour, you will be transferred back to your Hotel where you can prepare for tomorrow's trip, like re-packing and making sure you have all of the equipment necessary for the trekking journey. Overnight stay at the Hotel in Kathmandu. Early in the morning, you will have a short scenic flight to Lukla. For this, you will be transferred to the airport from the Hotel. The short flight is quite amazing and you can see the Himalayan periphery of Nepal from the window of the plane. Upon landing at Lukla, you will begin your wonderful trek to Phakding- one of the popular Himalayan villages of the Khumbu. The trail goes through amazing hillsides and when you approach Phakding, you will get your first glimpse of the Kusum Khangkaru Peak (6367m). Overnight stay at the guesthouse at Phakding. From Phakding, you will be winding your way through the Dudh Koshi River Valley towards the celebrated town of Namche Bazaar, passing through the settlement of Monjo along the way from where you will enter the Sagarmatha National Park. Namche is also called "the Gateway to Everest" and is a major commercial hub of the Khumbu. Overnight stay at the guesthouse at Namche. Today is set aside for acclimatization. It is important to get properly acclimatized while trekking as avoiding doing so can result in altitude sickness. You can visit the Everest View Hotel for the grand sights of the Everest peaks from the hotel's verandahs. After that, you can also visit the Syangboche airstrip that is situated above the Namche town. From here, you can see wonderful sights of the town below along with views of peaks like the Kongde Ri (6187m) towards the town's east and Thamserku (6608m) towards the north. Overnight say at the guesthouse at Namche. From Namche Bazaar, you will further trek into the Dudh Koshi River valley, making your way towards the village of Tengboche. Climbing up the rhododendron-laden terrain, you will finally arrive at Tengboche, the "spiritual center" of the region. Here at Tengboche, you can visit the holy Tengboche Monastery- a spiritual Buddhist place of worship. The views of peaks like Lobuche (6119m), Nuptse (7861m) and Everest (8848m) from the ridge at the monastery are one of the best Himalayan views of the region. Overnight stay at the guesthouse at Tengboche. Trekking on amazing green tracks overshadowed by tall pine and cedar woods, you will cross a suspension bridge over the Imja River and visit the village of Pangboche on your way to Dingboche today. Dingboche is situated in the Imja River Valley and is known as "the summer valley" of the region. Overnight stay at the guesthouse at Dingboche. Dingboche is a great place for acclimatization. From Dingboche, you can visit the Nangkar Tshang peak (5616m) as well, situated right above the village for majestic views of the Ama Dablam Peak (6856m), Mount Makalu (8463), Lhotse (8414m), Mount Cho Oyu (8188m), Mount Kangtega (6782m) and Mount Everest (8848m) among many others. Overnight stay at a guesthouse at Dingboche. Trekking on the hillside track, you will pass Pheriche where the Trekker's Aid Post is situated on your way to the village of Lobuche. The Khumbu Glacier moraine, situated further from Chupki Lharka offers views of mountain peaks like Khumbutse (6665m), the Mahalangur Himal range, Lingtren (6749m) and the Pumo Ri (7165m) from the moraine are absolutely brilliant. Once the glacier pass is crossed, you can also see Mount Nuptse (7861m) towering over the valley. Progressing further along the track, you will reach Lobuche. Overnight stay at a guesthouse at Lobuche. Making your way alongside the Khumbu Glacier Moraine, you will reach the small settlement of Gorakshep. From Gorakshep, you will carefully move further along the snowy landscape to finally reach the base camp of Mount Everest. Upon your arrival at the base camp, you can enjoy the sight of the Khumbu Icefall, as well as the views of Khumbutse (6665m) and Mount Lingtern (6749m). After spending some time at the base camp enjoying the sights and taking in the accomplishment of completing the journey to its final destination, we shall return back to Gorakshep. Overnight stay at the Guesthouse at Gorakshep. From Gorakshep, early in the morning, you will trek to the vantage point of Kalapatthar. It is one of the best highlights of the journey and the vantage point is famous for its panoramic views of the entire Mount Everest massif. The sunrise view amidst the Sagarmatha Himalayas seen from Kalapatthar is extremely uplifting and quite bewitching. After taking in the views at Kalapatthar, we will trek back towards Pheriche, walking on a beautiful trail of alpine woodlands and occasional terrace farms. Overnight stay at a guesthouse at Pheriche. From Pheriche, we will make our way back down the valley, along with the hillside track that is dug into the hill face itself. Crossing the Imja River again, we will reach Tengboche. The landscape is very diverse with the growth of ancient pines and scented maples and you can see the gaping open valleys and the river flowing below along the journey. Overnight stay at the guesthouse at Tengboche. From Tengboche, we will retrace our way back towards Namche, trekking along the beautiful cattle track with the views of the peaks keeping us company. 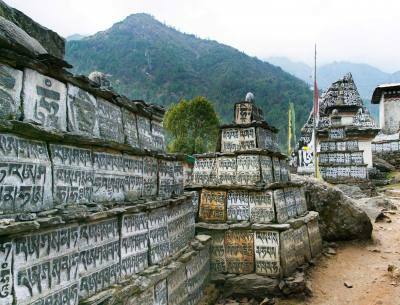 You can see many small Chortens and Gumbas along the way, as well as occasional Mani stone walls carved with Buddhist prayers and chants. For the most part, the track is also decorated with colorful prayer flags hung from tree branches and Chorten spires. Overnight stay at Namche Bazaar. From Namche, we will make our way back through the Dudh Koshi River valley, pass by Phakding and Monjo, exit the national park and reach Lukla. Today is great to relish the accomplishments you made during the length of the trek. You can also shop for souvenirs reflecting Himalayan ambiance. Overnight stay at the guesthouse at Lukla. From Lukla, you will catch the early possible flight back to Kathmandu, saying goodbye to the mountains. In the city, you can spend your time today as you please, resting or shopping, as per your preference. In the evening, you will also attend a special farewell dinner celebrating the completion of the trekking journey. Overnight stay at the Hotel in Kathmandu. Approximately three hours before your scheduled fight, you will be transferred to the airport by one of our staff members from where you will depart.